MatlinPatterson has sold luxury fashion house, Cerruti, to Li & Fung Group and listed on the Hong Kong stock exchange, for EUR 53 million ($47 million). Cerruti is a favorite in Hollywood, with Jack Nicholson, Julia Roberts, Richard Gere, and Denzel Washington on its fan-list. Other A-list clients include Tom Hanks, Harrison Ford, Sharon Stone, Robert Redford, Michael Douglas, and Diane Keaton. Matlin Patterson must have made a bundle on this deal. We mention Matlin Patterson as an example of the insiders who a profit from TARP funds. We had written previously on Geithner’s gift of your money to MatlinPatterson and Lap Wai Chan (wanted man in Brazil). MatlinPatterson defines itself as a “globally distressed private equity fund.” In other words, MatlinPatterson is a hedge fund. To make things worse, MatlinPatterson employs alleged fugitive Lap Wai Chan said to be a Chinese national, with Brazilian and US passports. Lap Wai Chan fled his home in São Paulo, Brazil for his posh Manhattan Lenox Hill town house at 171 E 64th Street. 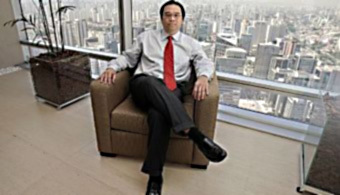 His dealings in Brazil have been termed, “Brazil’s Watergate.” Lap Wai Chan’s partner in MatlinPatterson is along with Mark Patterson—whose wife is a good friend of Rita Wilson, Tom Hank’s wife—very well-connected. How is it that a hedge fund, Matlin Patterson, is eligible to receive US bailout (TARP) funds when Main Street is not? Surely Tim Geither knows that Lap Wai Chan, a key figure at Matlin Patterson is a fugitive from Brazil. We pointed out that noted financial columnist Ambrose Evans-Pritchard’s article on Matlin Patterson, printed in England by the The Daily Telegraph and published on their website on May 14th, 2010 had been removed. Let’s not forget that Mark Patterson is not only being accused of calling the TARP a “sham” and a gift to speculators. He’s also the chap who seems to be doing end-runs around bank-ownership rules which seem to be designed to violate the spirit if not the letter of regulations barring private-equity shops from owning banks. This is how the establishment protects the crooks. We shall continue to follow Matlin Patterson and its TARP money.